Snapchat is available for iOS and Android. Not sure what these mean? Check here for some Snapchat lingo. Launch Snapchat and let’s get started. If you have friends who use Snapchat, you have likely seen a familiar face transformed into an adorable dog. It’s fun to turn yourself into a friendly pup with a playful tongue and adorable ears. You accomplish this with Snapchat’s Lenses. Switch the camera to selfie mode. Snap a picture.Wait for the white mapping to appear on your face. Once recognized, scroll through the circular icons at the bottom. Follow any instructions provided.Some Lenses direct you to do things like “raise your eyebrows.” Doing so usually adds an effect included with a particular Lens. Snapchat is constantly switching up its Lenses. Don’t be surprised to see new Lenses come and go on a regular basis. Snapchat also offers Filters for your photos. These overlay your photos with tints and other words. Many of the options use the location of your phone to offer geographically appropriate backgrounds. Here’s an example from Indianapolis. Snap a picture using either camera. Swipe left or right through the filter options. If you want to save the photo, select the Save icon from the bottom left corner. The fun of Snapchat comes with the ability to alter your photos to fit your personality. This wouldn’t be complete without the ability to add text, stickers, and emojis. You do this by using the icons on the right side of the screen. Select the T icon at the top right corner to enter text: Type your text and choose Done when finished. Tap the pencil to write on your image: This allows you to use your finger to add drawings by hand over the top of your photo. Adjust the color on the color palette or add a sticker by selecting the heart at the bottom of the palette. Choose the stickers button to add stickers: This gives you a broad array of emojis and other graphics to add to your image. Make your selection from the options. Use the Scissors icon to create stickers from images in your photo: Tap the scissors. Then use your finger to surround the image you want a duplicate of. Snapchat creates your duplicate sticker and you can reposition in your photo as necessary. The Paperclip icon lets you attach a website to your Snap: Type in the URL to select your site. The recipient of the Snap will see an arrow at the bottom. When selected, the recipient will see the attached website. Choose the Alarm Clock icon to choose how long friends can see your Snaps: Choose between one and ten seconds or the infinity symbol. Snapchat is always upgrading and adding features. Keep your eyes peeled for new fun ways to customize your photos. 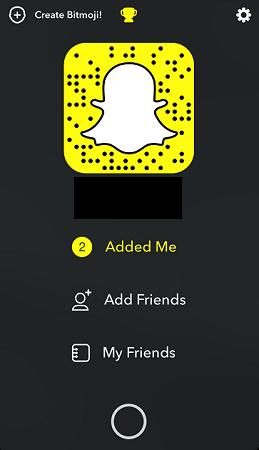 Check here to learn more about how to use Snapchat.